The “green” movement has introduced many new business practices for the Ski industry; however some laggards have been using the hype of this movement to enact minimal efficiency and sustainability measures and claim to be a “green” resort. The issue of green washing is pertinent in every industry; yet the backlash from consumers in the Ski industry could be devastating for the management organizations. The tourism industry is based purely on selling an experience. The trend shows that consumers will increasingly continue demanding sustainable measures be taken. This point seems to be especially true for the affluent customers who have tendencies of being well educated, thus willing to spend more in order to do their part. If an organization is discovered as green washing, the backlash can be immense. An organization known as the Ski Area Citizens Coalition is a watchdog in the industry and rates ski areas based upon their environmental impacts and mitigations measures. The organization grades each resort on a series of four categories equaling 230 points. The studies are skewed as an 81.7% is an A and a 61.3% is considered a C. The importance of this organization and the effects it has on the industry cannot be understated. The organization shows to the public the real environmental grade each resort has. As a skier, I just assumed that Breckenridge would be highly rated on the list as they are a major Colorado Ski area and imaging matters. I was surprised to find that Breckenridge was ranked second to last with a score of 50.1%. As a consumer, I have never skied at Breckenridge, however as I am a Colorado Pass holder, I will choose not to frequent this location. The resort has lost out on business from me until their score improves, and I’m sure I am not the only person who doing this. Green washing has misled the public, and the backlash may be substantial. Ski resorts may seem clean with their white slopes and first class accommodations. However this is far from the case. The ski industry is inherently dirty due to the various services offered. One of the largest areas needing improvement is the amount of water required to run a ski resort. Now it’s clear that the hospitality side of ski areas consumes large amounts of water. However a significant consumer is snowmaking. Snowmaking is water intensive because well, it takes water, shoots it out at fast speeds in order to freeze it. The amount of water necessary is immense. I was thinking about this the other day and a great way to reduce the water used by snow making is pretty simple. Ski areas could create water collection lakes at various place at the base of the mountain. The resorts could use this water in the early and late season when snow is lacking. Then, when the snow melts in the spring, it will conveniently run downhill into the newly created lakes. This won’t do much for the visitor experience, unless a trail system was created and the lakes were beautified. However, the immediate water and cost saving would be immense. The only new cost associated with creating the lakes would be building the retaining wall. While the savings would include pumping costs purchasing and pumping the water to the mountain. This seems like an oblivious solution to an already water deficit state. I found this article interesting. There’s this little town in Switzerland that has created the first lift in the world, completely powered by solar power. The lift, a T-Bar, creates over 90,000 kilowatt hours of clean electricity a year. The lift consumes about a third of the total electricity produced. This seems like a smart invest at $1.5 million (US). The town is fairly isolated. Creating energy year round that has already been paid for seems like a great way to reduce the towns dependence on costly fossil fuels that must be sent through electrical lines. Granted this lift uses only a fraction of a high speed four person chairlift (quad), this is a great way to create energy that is basically free after the initial cost is depreciated. Implementing similar projects in the United States may not be feasible. Part of the overall tourism experience at a ski area is directly related to the aesthetic appeal of the area. I can guarantee you that someone paying thousands of dollars for the mountain experience won’t want to look at solar panels the entire ride up. It’s boils down to simple marketing. Ski areas in Colorado generally attract two major demographics. Locals who spend very little money at the resort and who generally own a season pass, and vacationers who spend thousands of dollars of lodging, restaurants, lift tickets, airfare, and other amenities. No ski resort is going to knowingly alienate their out of state customers. It would be economic suicide. I love the idea though. People are realizing that dependency of a finite energy source will continually be financially taxing, as well as environmentally degrading. 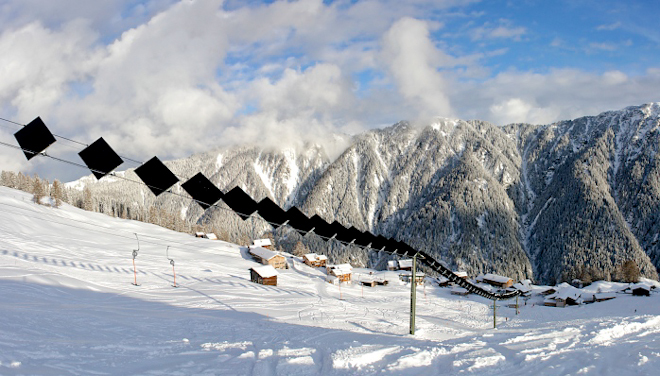 Some form or utilization of renewable energy sources for the ski industry is a necessity. The first ski areas to implement widespread clean energy initiatives will have an incredible marketing advantage. One of the main reasons is the cost savings, which is almost as good as making more money. The more money you don’t spend on energy consumption, the more money you can allocate towards amenities, guest relations and other experiential aspects. Another important aspect of this would be the brand imaging. Due to local zoning issues, lack of subsidies similar to the oil industry, and overall expense of renewable energy, these sources are still very much associated with affluent consumers. Ski areas can use this as an edge. Buyer behavior studies have found that affluent people are willing to spend slightly more, or will choose an option based on its carbon footprint, or lack thereof. Implementing widespread renewable energy sources at ski areas across the world is a great way to create sustainable tourism opportunities cheaply.